7 February 2017. Researchers at MIT and Harvard University designed a tiny device that in tests with animals show it can run for days powered by acids in the stomach. The results of the research appear in the 6 February issue of the journal Nature Biomedical Engineering. The team led by Giovanni Traverso, a gastroenterologist at Harvard Medical School and Brigham and Women’s Hospital affiliated with Harvard, and Massachusetts Institute of Technology engineering professors Robert Langer and Anantha Chandrakasan, seeks ways of extending the life of ingestible devices for drug delivery and diagnostics. While battery technology is advancing into miniaturization, conventional cell batteries — even when miniaturized or producing little power — can still completely discharge over time and run risks of leaking their toxic contents. Thus better options are needed to power ingestible devices for an extended length of time. The technology for ingestible devices is also advancing due in part to the work of Traverso and others that develop new types of these miniature systems. 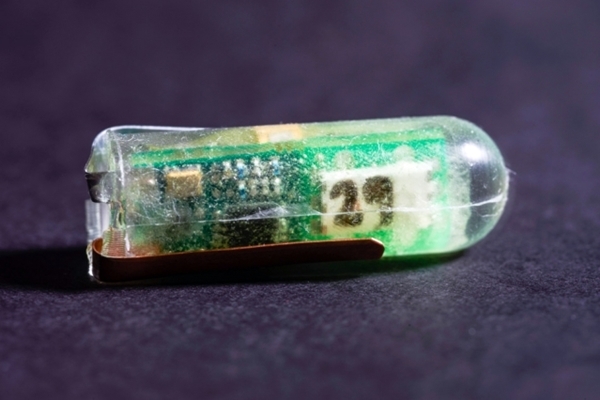 As reported in Science & Enterprise, Traverso with Langer and colleagues designed an ingestible device with sensors for monitoring a person’s vital signs. In November 2015, their team described tests of a prototype device on pigs, which was connected by wires and externally powered. Another team created a test device to deliver long-term malaria drugs. Acids, like those in the GI tract, are known to carry electric currents, and in previous studies systems for employing these acids produced short bursts of power, but not for extended periods. The researchers built a prototype device 40 millimeters (1.6 inches) in length and 12 millimeters (0.5 inches) in diameter. Attached to the surface of the device are electrodes made from zinc and copper foil. Inside the cylinder are a commercial temperature sensor and low-power wireless transmitter circuits. The team also tested use of the device for drug delivery, although these tests were done in lab dishes, not animals. The researchers added a biocompatible polymer compartment containing the drug methylene blue, given for low blood pressure, sealed in a gold membrane, then dropped the device into gastric fluids taken from the pigs. The combination of electric current and gastric fluids corroded the gold membrane allowing for the release of the methylene blue. The membrane was not affected by the gastric fluids alone. The researchers reported the findings as a proof of the concept, but they acknowledge the need reduce the cylinder to about one-third of its current size. Nonetheless, the institutions filed for a patent on the technology. Traverso and Langer are also founders of the company Lyndra Inc. in Cambridge, Massachusetts to commercialize technology that extends the release of oral medications to one week.